WASHINGTON (Reuters) - The Lockheed Martin Corp F-35 fighter jet dropped a 500-pound bomb this week, hitting a tank at Edwards Air Force Base in California and marking the first time the new warplane has fired a laser-guided weapon, the Pentagon said Wednesday. An F-35 B-model jet released the Guided Bomb Unit-12 (GBU-12) Paveway II bomb from its internal weapons bay while flying at around 25,000 feet, successfully smashing into a tank parked on the ground, the Pentagon's F-35 program office said in a statement. It took 35 seconds to hit the target. "This guided weapons delivery test of a GBU-12 marks the first time the F-35 truly became a weapon system," said Marine Corps Major Richard Rusnok, the pilot who flew the plane during the weapons test Tuesday. "It represents another step forward in development of this vital program." 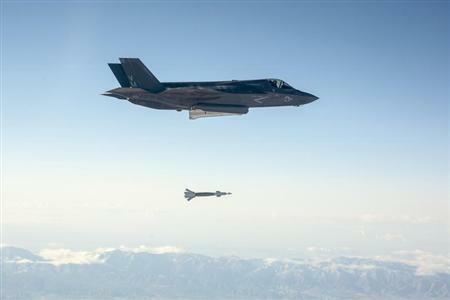 Different F-35 models have test-fired missiles during flight and over water. But this marked the first time the jet had fired a guided weapon at a ground target. After more than a decade of development, the $392 billion F-35 Joint Strike Fighter program is making strides in testing, production and operations. The Marine Corps plans to start operating the planes in mid-2015. The Pentagon's top arms buyer, Frank Kendall, this week said the F-35 program had made sufficient progress to budget for higher production in fiscal year 2015, but said he remained concerned about progress on the jet's software, reliability and a computer-based logistics system. The GBU-12 weapons test will be followed later on Wednesday by a live fire test at Edwards Air Force Base of an AIM-120 Advanced Medium Range Air to Air Missile, or AMRAAM, built by Raytheon Co.
A test of the F-35's ability to drop a 1,000-pound GBU-32 built by Boeing Co is planned next month. The GBU-12 Paveway II is built by Lockheed and Raytheon. Tuesday's test was not considered a live fire test since the bomb did not carry explosives, said Kyra Hawn, a spokeswoman for the F-35 program. She said no explosives were used in order to save money, since the real point of the test was to ensure that the fighter jet would be able to accurately deliver the bomb onto a ground target. The F-35 used its Electro-Optical Targeting System (EOTS), built by Lockheed, to allow the pilot to identify, track, designate and accurately deliver the bomb on target. Hawn said EOTS is the world's first sensor to combine forward-looking infrared, infrared search and track, and a laser designator to allow F-35 pilots to hit targets. Last week, the Navy variant, or F-35C, released its first weapon during testing at Naval Air Station Patuxtent River in southern Maryland, and the Air Force version, or A-model, did the first ground release pit testing of a GBU-39, a 250-pound small diameter bomb. Lockheed is developing three models of the new radar-evading warplane for the U.S. military and eight countries that helped fund its development: Britain, Canada, Turkey, Italy, Norway, Australia, Denmark and the Netherlands. Israel and Japan have also placed orders for the jet.